The first “real” season of Overwatch’s official minor league, Contenders, kicked off over the weekend, and it was characterized by underdog teams repeatedly flipping the script. Is Gigantti a new European juggernaut? Possibly. Many have observed, however, that four of eUnited’s six members spent recent weeks playing for three different Overwatch World Cup teams, forcing them to settle into different team play dynamics and leaving all their Dragon Blades looking a bit rusty. The perceived problem with Rogue is that they’ve relied on similar comps and strategies for months now, so other teams know what to expect. They might not be slipping so much as everybody else is catching up. Still, it was an extremely unexpected loss, and it’s got people justifiably wondering if Rogue can rally before they get bounced out of this season of Contenders. In the end, Immortals lost 0-4, looking disappointingly rigid in their team comp and tactics while EnVy styled on them with measured innovation. During the same weekend, it should be noted, a handful of other teams, foremost among them GamersOrigin, also had tremendous success with Doomfist. Lucas “Leaf” Loison and Gael “Poko” Gouzerch pulled off a highlight reel “gravfist” ult combo that both demolished and demoralized rival team Bazooka Puppiez. A couple days before Contenders kicked off, Lunatic Hai, widely regarded as the best Overwatch team on Earth, dropped an upset to relatively unheralded team MVP Space in season four of the Korean APEX tournament. There, too, the story of the day was Doomfist, with some slick backup from Pharah. Doomfist, despite his seemingly one-dimensional approach—“Punch Things Real Good”—is a threat on multiple levels. Sure, he can deal assloads of damage with his fists, causing me to unintentionally write sentences that sound vaguely pornographic, but smaller wrinkles in his kit make him uniquely tough for dive comps to handle. First and foremost, his punches have a lot of knockback on them, and dive comps are reliant to a fault on positioning and mobility. Got a D.Va about to eat a crucial ult with her defense matrix? Just punch her out of the way. Is a Winston going berserk on your backline? Not after a couple solid punches. 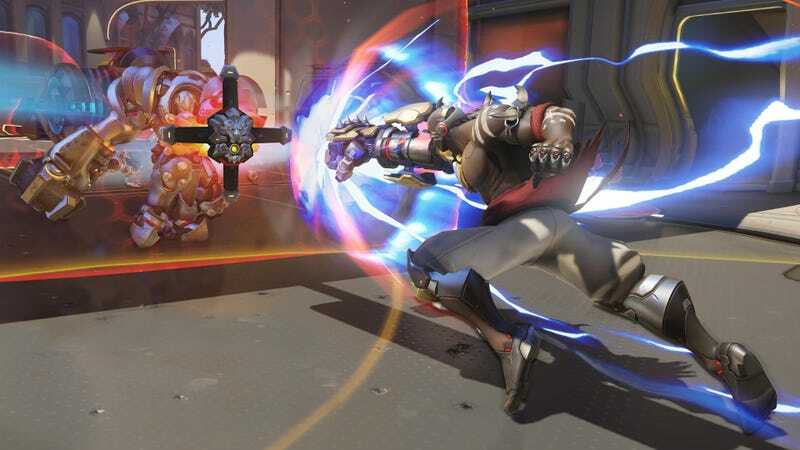 Then there’s Doomfist’s ult, which he can use to basically teleport into the backline (especially on more constrained control maps like Oasis) and wreak havoc on supports. Doomfist does have some very exploitable weaknesses if he can’t get a good combo going or, conversely, if he finishes a combo and doesn’t have anybody supporting him from afar, but so far, hardly anybody seems to know quite how to exploit them. Pro Overwatch is in an odd spot right now, both in regards to its (finally) evolving meta and the timing of the Overwatch World Cup, which seems to have left some teams scrambled and out of sorts. Many matches this weekend ended up being exciting to watch not because they were competitive (quite the contrary: you’ll notice that the upsets were all pretty damn one-sided), but because it felt like anybody could win—even if they weren’t supposed to. Will this madness last, though? I doubt it. In the coming weeks, I imagine teams displaced by the World Cup will regain their footing. Mark my words: everybody and their grandmother (who doesn’t really get what this whole “esports” thing is all about, but is very supportive) is now crunching away on reliable Doomfist counters. How and when things will settle is anybody’s guess. Right now, though, Overwatch is more interesting to watch than it has been in months. I can’t complain about that.